For the budget conscious who still want to get in on the latest fad – a Budget Spinner! These lower cost Spinners are just as great for relieving stress and boredom. Simply place your thumb and index finger on each side of the middle of the spinner then spin the stress away. 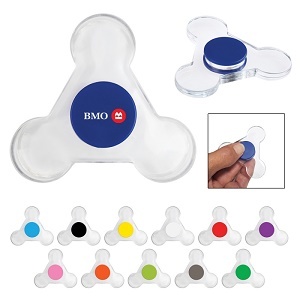 You can imprint a logo on the middle of the spinner. 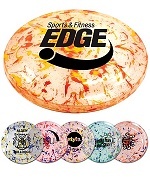 Cap colors available in black, gray, green, light blue, lime green, orange, pink, purple, red, royal blue, white or yellow. Great for anxiety, focusing, ADHD, autism, quitting bad habits, staying awake. Easy to carry, small, simple, discrete and fun, also effective for focus and deep thought. Please let us know Cap Color. Second Side Imprint is available. Please contact us for additional charges. Give us a Call or Text at 706-258-7041 to put our years of promotional and advertising experience to work for you. FREE quote provided.